Charlotte Mayor Anthony Foxx just accepted President Obama’s nomination to be the next transportation secretary. Before we get into the details of Anthony Foxx’s résumé and policy positions, let’s just take a moment to appreciate this: The White House has nominated a mayor to be secretary of transportation. There is often a wide gulf between states and cities when it comes to transportation policy — with cities preferring to invest in multiple modes while states mainly spend on highways. One way to interpret Obama’s nomination of a mayor to head U.S. DOT is that he’s casting his lot with cities. In Foxx, he’s selected the chief executive of a southern city that has made significant progress on transit and walkable development the last few years. Foxx has only been mayor since 2009, and the city was already heading in the right direction. Charlotte’s light-rail system, LYNX, launched in 2007, and its complete streets policy won an award before he took office. But Foxx has also made his own mark. 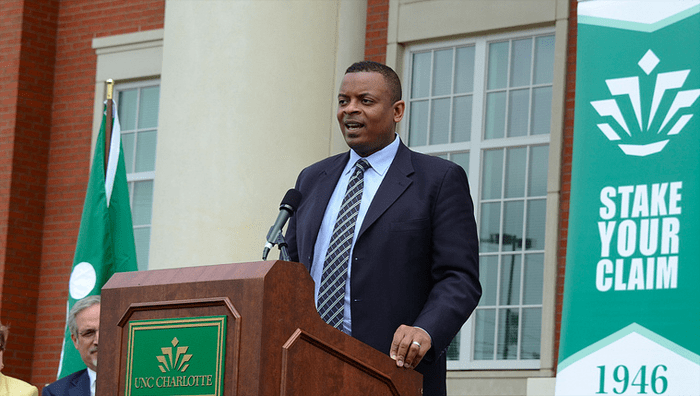 As mayor, Foxx oversaw the extension of the city’s one light rail line, a project which will nearly double the Blue Line’s length and extend it to the UNC-Charlotte campus by 2018. He’s also been a champion for Charlotte’s downtown streetcar project, which currently consists of just a short starter line but which Foxx and local transit advocates want to turn into a 10-mile route in Center City to spur more walkable development. He hasn’t been able to convince the City Council to support it, but the White House has supported the project to the tune of $25 million. Foxx also seems to get the value of bicycling. Under his leadership, Charlotte has built out its bicycle network and begun a bike-share system. “During his tenure Mayor Foxx has been supportive of initiatives including an expansion the city’s bike route network, green bike lanes, bike boxes, sidewalk construction projects and other projects to meet bicycle and pedestrian needs,” Tobe Holmes, a board member at the Charlotte Area Bicycle Alliance, told the Alliance for Biking and Walking. “He clearly understands the importance of biking and walking to creating a vibrant and economically successful community where businesses want to locate; where people want to live, raise a family and retire; and where people have a real choice of transportation modes,” said Andy Clarke, president of the League of American Bicyclists, in a statement. It’s not all bike-share and streetcars, of course – Charlotte is a sprawling city, and Foxx hasn’t put his foot down against highway expansion. In fact, he secured funding to complete a 60-mile beltway and has supported widening I-85 from six lanes to eight according to Next City’s Matt Bevilacqua. Foxx also helped lead the expansion of the Charlotte airport. LaHood, the man Foxx will replace, learned fast on the job and surprised everyone with his strong commitment to sustainable transportation and understanding of the connections between transportation, housing, and environmental policy — connections mayors deal with every day. But LaHood wasn’t chosen for those qualities. In fact, in the beginning, few expected his tenure at U.S. DOT to go in the direction it did. He was chosen first and foremost because he was a Republican, as an overture across the aisle – an overture that clearly didn’t work. Now Obama has chosen a rising star in the Democratic party whose city hosted the Democratic convention last year. And this rising star does come to the job “with a predisposition to seeing how transit can potentially transform a city that’s been almost entirely auto-dependent into one that’s more walkable and pedestrian-friendly and be a driver of economic growth,” said Joshua Schank of the Eno Center for Transportation. “The choice shows an interest in continuing to focus on metropolitan transportation priorities,” Schank said. Charlotte was the case study for a 2011 research paper on the impact of rail transit on obesity. Social scientists and health experts found that LYNX riders’ body mass index fell by an average of 1.18 points compared to those who didn’t ride the system, and were 81 percent less likely to become obese over time. Schank speculated that studies like that have helped open Foxx’s mind to the broader benefits of sustainable transportation, including the environment and public health benefits. Still, Schank had been hoping the administration would put forth a technical expert this time around. President George W. Bush did that when he nominated Norman Mineta – a signal of bipartisanship, yes, but also someone with a résumé in transportation policy. Schank expects Foxx – like LaHood – to be a loyal implementer of White House policy, not someone who goes above and beyond the administration’s priorities. Foxx’s nomination will have to be confirmed by the Senate after a hearing before the Commerce Committee. Committee Chair Jay Rockefeller said he intends to formally submit Foxx’s nomination and will announce soon the date of the confirmation hearing. Transportation Populist, no? Give people what they want, even if the results partially cancel each other out….. I wonder what this means for the future of transit in Charlotte, now that its main advocate will be gone. Mostly thanks to the former Mayor, a Republican who is now the Governor. Uff, this one’s out of the way. Was worried about the next transportation secretary. Now, if we can get a progressive, transit and cycling supportive NYC Mayor I’ll sleep better. Finally some Foxx news I can agree with! IT IS Genuinely Really Helpful FOR ME.I LIKE YOUR Publish Simply because IT IS Very Beneficial FOR ME AS Effectively. HOPING THE Same Very best Work IN THE UP COMING Days ALSO. THANK YOU! I wish Mayor Foxx the best, but I wonder how qualified he is for the position, and he certainly has big, no, huge footsteps to follow. And the challenges – with expiration of MAP-21 at the end of next year, and the bankruptcy of Highway Trust Fund following that – I’m even wondering who would want the position! After developing policies to make transportation systems more equitable at U.S. DOT under Anthony Foxx, Keith Benjamin is helming the city DOT in Charleston.